As I’ve been exploring Windows 7 I ran across a real gem. 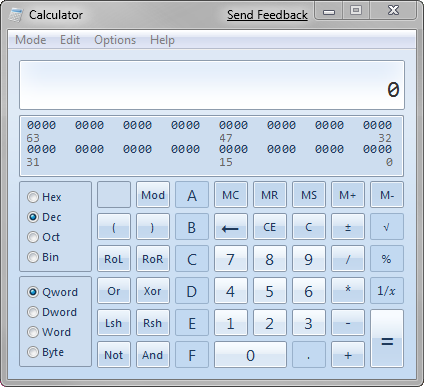 The newly redesigned calculator. For Windows 7 it’s received a nice face lift, and the previous functionality of standard mode and scientific modes are still there. There’s a statistical mode, but what’s cool for developers is the new programmers mode. While the .Net Framework saves us from having to deal with a lot of bit math, this will still be useful to many developers. If you haven’t take a look do so, it’s one of the many things I’m looking forward to with Windows 7.